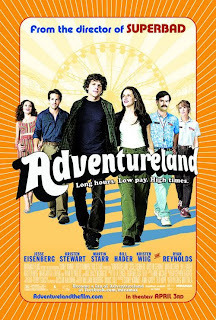 Arriving with what prove to be outsized expectations for raucous humor on the basis of "Superbad," Greg Mottola's "Adventureland" unspools as a rather ordinary account of youthful summer misadventures that goes down easily thanks to a sparkly cast, more than 40 pop tunes that anchor the action in the late '80s and characters who get high both on and off their jobs at a tacky amusement park. Thanks especially to the presence of leading lady Kristen Stewart in a role she filmed prior to "Twlight," the pic should spin good returns for Miramax on its March 27 release. Based on the experiences he had working at a Long Island amusement, Mottola cooks up a passable amount of mischief to occupy the late- teen/early-20s misfits who work as ride and game operators at Pittsburgh's Adventureland in the summer of '87. Writer-director's evident stand-in is James Brennan (Jesse Eisenberg of "The Squid and the Whale"), who's forced to take any summer job he can get when his European trip is dashed and his autumn date with grad school at Columbia is jeopardized by his alcoholic father's fall from grace at work. For a Reagan-era pothead, James is a terribly serious, woefully earnest guy who offers up his SAT scores when applying for low-end summer positions. He also somehow has emerged from college still a virgin, but his saving grace as far as his Adventureland cohorts are concerned is that he's always has some weed. This makes the days go by easier, and also fuels the night, which the gawky James surprises himself by chastely spending with the alluring but massively screwed up Em (Kristen Stewart), who works at the park only as a way or getting away from her father and unbearable new stepmother. What James doesn't know is that Em is having a clandestine affair with older local musician and handyman Mike Connell (Ryan Reynolds), to whom James sometimes confesses his amorous feelings for Em. Adding further to the equation is a flirty cupcake Lisa P. (Margarita Levieva), a known virgin-for-life who nonetheless encourages James' attentions. The set-up provides plenty of opportunity for crude humor, Mottola indulges with abundant involving puking, groin pinches, drunk and stoned behavior, and lax work habits. But his real interest is the navigation of dubious emotional and ethical straits by immature characters who make serious mistakes while trying to feel their way out of their unhappiness. The filmmakers' investment in James' sudden loss of a safety net, Em's justifiable distress at home, and brainy stoner Joel's (Martin Starr) fury over a one-time date's anti-Semitism is genuine as far as it goes, but little that happens here is particularly surprising, especially the occurrence of some virginity divestment at the end. Rather off-putting at first with his furrowed-brow attitude, Eisenberg's James becomes increasingly palatable as the summer progresses. Stewart impresses again with her steady, clear-eyed gaze and sense of self. Nice comic turns are put in by Starr as the Gogol-reading outcast and Bill Hader and Kristen Wiig as the goofball but dedicated park owners.